Team Bath Netball produced an “absolutely awesome” performance to record their biggest win of the 2017 Vitality Superleague season to date as they defeated Severn Stars 59-33 on Friday. The first-ever West Country derby at the University of Bath promised to be a tight affair, with Stars going into the game on the back of an excellent win against Surrey Storm. However, they came up against a home side in inspired form right across the court and, once they had established a seven-goal cushion at half-time, the Sitec-sponsored Blue and Gold played some wonderful netball to stretch their final winning margin to 26 goals. All 12 squad members played their part in the win, which was Team Bath’s second at home in six days and the perfect way to prepare for Bank Holiday Monday’s crucial visit to fourth-placed Storm. Delighted captain Eboni Beckford-Chambers said: “That was an absolutely awesome win and some of the best netball I have seen us play this season. It was a really connected performance, a full 60 minutes of everyone doing their job in attack and defence. “Chelsea Lewis was absolutely phenomenal, Rachel Shaw led the way in attack, Vangelee Williams came on and got some amazing stolen ball – everyone showed a great work ethic and it was a real standout team performance. Head coach Anna Stembridge added: “I am really proud of the team tonight. We knew Stars were going to come out hard but it was about us staying true to our game plan. “I don’t think the final scoreline reflects how hard Stars made it for us. What I am most proud of is we had seven players in defence and seven players in attack – we were one unit. An entertaining first quarter saw the teams evenly matched during the opening stages before Team Bath produced some slick attacking in the closing minutes to open up a 13-8 lead. With the home defence once again demonstrating why they are the best in the Superleague this season with some outstanding pressing and timely intercepts, Team Bath were able to stretch their advantage to ten goals midway through the second period. Shantal Slater came on at GS and Lewis switched to GA as Team Bath made an attacking change. While they were settling in to their new roles, Stars put together their best spell of the period to cut the deficit to 23-17 before player of the match Lewis scored right on the buzzer. 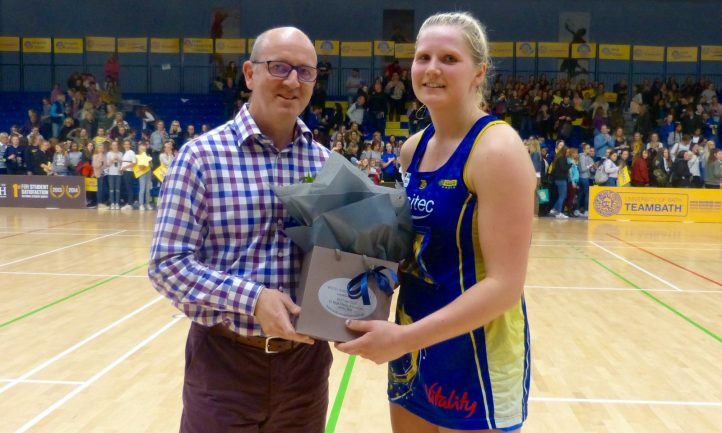 Jess Shaw came on at centre and Williams was introduced at wing-defence during a third period that saw Team Bath produce arguably their best netball of the season so far. They were dominant right across the court and had the crowd on their feet with some wonderful attacking play as they won the quarter 19-9. That excellent form continued into the final quarter as, despite some spirited play from the visitors, Team Bath continued to pull away. Paige Reed and Sam Cook came on to great effect, meaning all 12 squad players contributed to an outstanding victory. After the crunch trip to fourth-placed Surrey Storm on Bank Holiday Monday (3pm), Team Bath return to the University of Bath Sports Training Village on Monday, May 8 to face high-flying Wasps (7.45pm). Everyone who purchases a ticket for that game before Saturday, May 6, will be entered into a prize draw to win a training day with Team Bath’s Superleague stars. 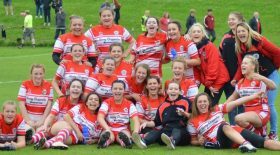 Tickets for that game, and the final home match of the 2017 season against Sirens, are priced £12 for adults, £8 concessions and £35 for a family ticket. Visit www.teambath.com/events/ticketline or call 0844 888 4412 for details. Today’s Superleague game was preceded by an U21 Netball Performance League fixture which saw Team Bath win the second quarter 18-3 on their way to an excellent 59-36 victory over Stars. Starting seven: GS Chelsea Lewis, GA Laura Rudland, WA Rachel Shaw, C Mia Ritchie, WD Imogen Allison, GD Layla Guscoth, GK Eboni Beckford-Chambers. Replacements: Shantal Slater, Paige Reed, Jess Shaw, Vangelee Williams, Sam Cook. Changes: Q2: Slater – bench to GS; Lewis – GS to GA; Rudland – GA to bench. Q3: Jess Shaw – bench to C; Ritchie – C to bench; Williams – bench to WD; Allison – WD to bench. Q4: Reed – bench to GA; Lewis – GA to bench; Cook – bench to GD; Guscoth – GD to bench; Ritchie – bench to C; Jess Shaw – C to WA; Rachel Shaw – WA to bench. Starting seven: GS Ellie Cardwell, GA Yasmin Hodge-England, WA Iona Darroch, C Laura Malcolm, WD Rebecca Oatley, GD Jodie Gibson, GK Josie Janz Dawson. Replacements: Lauren Brooks, Sophie Carter, Rachel Sweet, Rebecca Tildesley, Phillipa Yarrington. Changes: Q2: Cardwell – GS to GA; Hodge-England – GA to GS. Q3: Carter – bench to C; Malcolm – C to WD; Oatley – WD to bench. Q4: Janz Dawson – GK to bench, bench to GK; Gibson – GD to GK, GK to bench; Sweet – bench to GD; Tildesley – bench to GS; Hodge-England – GS to bench. Q1: 13-8. Q2: 24-17 (11-9). Q3: 43-26 (19-9). Q4: 59-33 (16-7). Report courtesy of Team Bath Press Office at Matchtight Ltd.